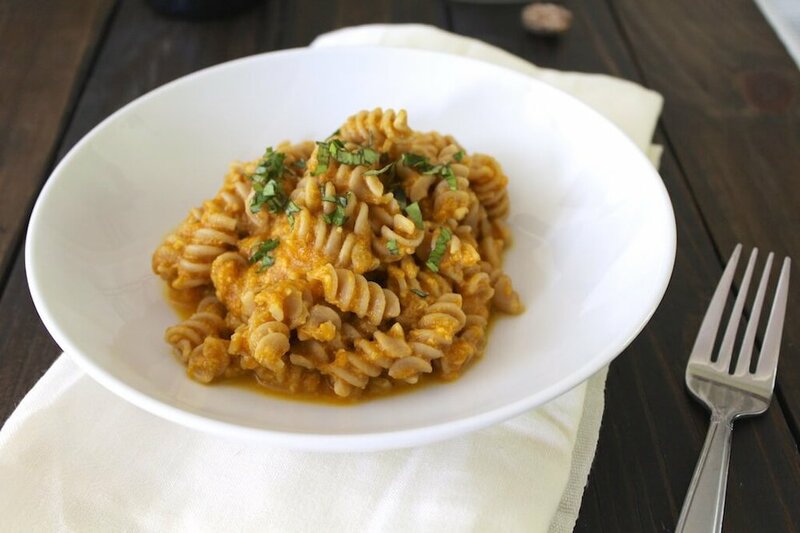 Several years ago I came across a recipe using pumpkin puree for a pasta sauce. Brilliant! I have loved the dish ever since. I created this lighter version that skips the butter and cream. The sauce is simple and can be made in less time than it takes for the pasta to cook. Fresh grated nutmeg and sage make the dish, however, basil can be used in place of the sage. This is the perfect dinner for welcoming fall! Boil a pot of water and cook the pasta until al dente. Drain, rinse with cold water and set aside. In a large skillet, heat the olive oil over medium heat. Add the garlic and cook for 30 seconds, just until fragrant. Add the pumpkin puree, Greek yogurt and milk. Stir to mix thoroughly. Add the red pepper flakes, nutmeg and salt. Cook over medium heat stirring occasionally for about 5 minutes. Stir in the fresh sage and parmesan cheese, until cheese is melted. Remove from heat and add to cooked pasta, stir well. Serve immediately. Top each bowl with fresh grated parmesan cheese, sage and ground nutmeg (optional).